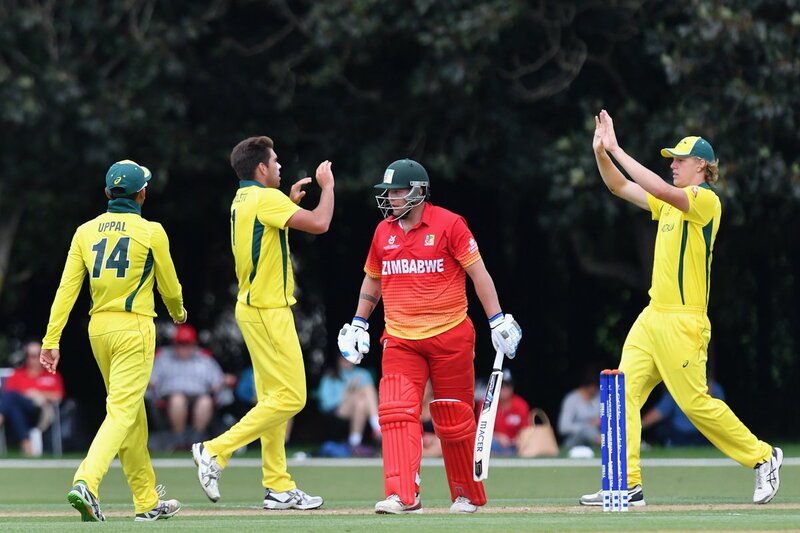 Australia brought back their World Cup campaign on track with an impressive 7-wicket victory over Zimbabwe on Wednesday (January 17) in Lincoln. The three-time champions were in control right from the outset as they chased down the 135-run target with utmost ease to register their first win of the tournament. Reeling from the 100-run defeat in their tournament-opener at the hands of India, Australia opted to field first, and the decision was completely justified by their bowlers as they bowled out Kenya for just 134 in the 34th over. The African country lost wickets at regular intervals which never allowed them to get the impetus for a good total. Opening batsman Gregory Dollar was the first to depart after being dismissed by Xavier Bartlett when the scoreboard was reading just 12. Half of Zimbabwe’s side was in the hut for just 69 as they never recovered from the early setbacks. In fact, they were looking set to get dismissed under hundred runs, but Robert Chimhinya’s 27-run knock helped them avoid an embarrassing score before they were eventually folded up for 134. The score was never going to be a tough ask for the Australians and their openers – Max Bryant and Jack Edwards all but ended Kenya’s hopes by adding 46 runs for the first wicket. It was followed by a 62-run stand between Bryant and captain Jason Sangha. The Australians eventually reached the target in the 19th over. Australia 135 for 3 (Bryant 44, Edwards 40) beat Zimbabwe 134 (Chimhinya 27, Bartlett 3-20) by seven wickets. Follow all the U-19 WC news here: ICC U-19 World Cup 2018.